Giotto di Bondone (ca. 1266-1337) - Many historians mark the life of Italian artist, Giotto di Bondone, as the start of Europe's slow arduous climb out of the "Dark Ages" and into the Renaissance Period. Renaissance means "re-birth" and refers to the re-birth of learning or rediscovery of ancient knowledge which had been lost after the fall of Rome. It began in Italy in the late 13th Century and from there spread throughout Europe. Giotto was one of the sparks of this rediscovery. Unfortunately, outside of his work which he left behind, few events of his life are known with certainty. He was from the city of Florence in North Central Italy, but his most famous work was done in Padua. 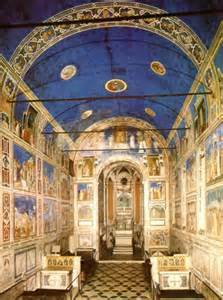 It is the fresco walls of the Scrovegni Chapel completed in 1305. He is known to have studied under one of the great painters of his day, Cimabue. One of the characteristics of Giotto's work is that it represented a break from traditional Byzantine art which was the dominant influence at the time. As a result, it could be said that Giotto was perhaps the first painter in Western Europe to abandon conventional art and create a style all his own. One reason so little is known about his life is that there were so few chroniclers at this time. But one of them, Giovanni Villani, called him "the most sovereign master of painting in his time." Interestingly, he was a contemporary of his fellow Florentine, Dante (see Dante Alighieri), and even drew a portrait of the poet.